No one disputes who pulled the trigger, in fact Cherokee Sheriff’s Deputy Jason Yarbrough admits to shooting. Now why would a peace officer point a gun at a child who posed no threat to anyone? Parents called police to help, did they expect an army of military grade officers to appear and shoot to death their child? Its obvious and wrong what the officer did but when government hides the truth and protects a murder with excuses they set an example for justice. Having your friends and co-workers then do an investigation is yet another wrong and injustice. The use of force and military grade weapons used in urban areas where children play and your loved ones lived is WRONG. Guns are to be respected and only used by those fully able and capable of proper decisions. Its too easy to pull a trigger and blame it on the wind or just a noise. Major Media fails to expose and report about how Police often kill innocent people or go on out of control shooting people. The public is not informed that soldiers trained to kill and doing nothing but killing come home and are hired as police. Are we really hiring the right police chief’s, management and so called experts? When someone you know is gunned down, beat to death, abused by police and you find out nothing is done about the problem officers you’ll better understand the problem. Is it “justice” when the man who killed him – Jason Yarbrough – has so quickly and casually been cleared of wrongdoing? 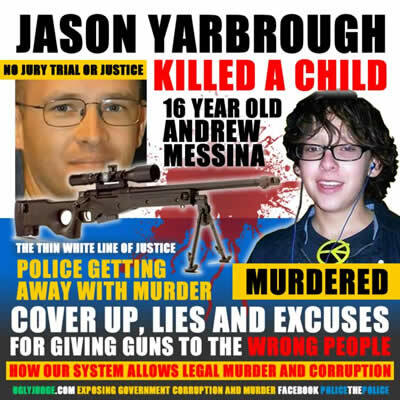 COP BLOCK Did Andrew Messina have to die?